Roughing filtration is an important pre-treatment process for wastewater, because it efficiently separates fine solid particles over prolonged periods, without the addition of chemicals. For this study, a pilot plant was designed at Delmas Coal Mine in the Mpumalanga province of South Africa. The design and sizing of the pilot plant was guided by Wegelin's design criteria. Gravel was used as a control medium because it is one of the most commonly used roughing filter media and because it was used in developing the criteria. We compared the performance of gravel as a filter medium to that of another locally available material, charcoal, for the removal of turbidity in wastewater. The pilot plant was monitored continuously for 90 days from commissioning until the end of the project. 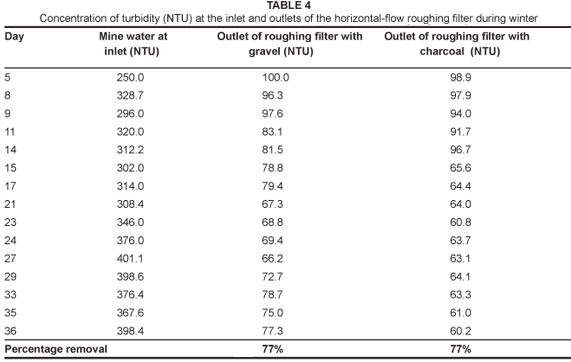 The overall performance of the roughing filter in turbidity removal, using gravel or charcoal, was considered efficient for the pre-treatment of waste water. 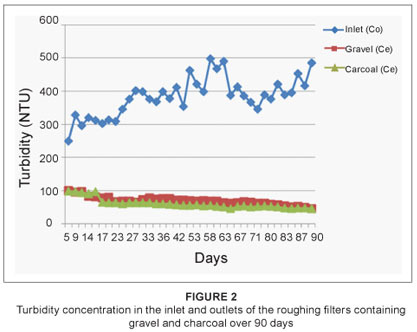 Charcoal performed slightly better than gravel as a filter medium for the removal of turbidity, possibly because charcoal has a slightly higher specific surface area and porosity than gravel, which could enhance sedimentation and other filtration processes, such as adsorption, respectively. South African population numbers have grown dramatically during the past years and this growth is expected to continue. Despite obvious inequalities within a variety of social, economic and political dispensations, this population growth has been accompanied by an equally dramatic increase in the demand for water. South Africa has already surpassed the point at which the scarcity of water supplies effectively limits further development, which is considered by Falkenmark5 to indicate severe water stress or water deficit. Based on present population trends and patterns of change in water use, South Africa will reach and exceed the limits of its economically usable land-based water resources before the year 2025.4 These sobering statistics emphasise the urgent need to find sustainable solutions to ensure the availability of secure and adequate water supplies for South Africa. One possible solution is the effective treatment of wastewater. Roughing filtration is one possible method for the treatment of wastewater. Previous studies have shown that roughing filtration is an effective and reliable method for removing suspended solids, turbidity and coliform bacteria.7,8,9,10 Roughing filtration provides superior treatment to basic sedimentation methods for suspensions with particulates that do not readily settle11 and represents an attractive alternative to more costly conventional coagulation methods. Roughing filters are primarily used to separate the water from the fine solids that are only partly retained, or not at all, by stilling basins or sedimentation tanks. In addition to solid matter separation, roughing filters also partly improve the bacteriological water quality and, to a minor extent, change some other water quality parameters, such as the colour of the water and the amount of dissolved organic matter.11 In terms of the technical labour requirements, daily operation, maintenance costs and treatment efficiency and effectiveness, roughing filtration is a simple, efficient and cheap pre-treatment technology for the treatment of drinking water or wastewater when compared to conventional systems, such as chemical coagulation methods.12 The main aim of this study was to evaluate the effectiveness of a roughing filter system using locally available materials, gravel and charcoal, as a quality and effective pre-treatment method for wastewater. A typical roughing filter consists of a series of graded gravel beds, with the first bed having the coarsest material and the final bed having the finest material. Typical roughing filters have gravel of different sizes in one, two or three compartments. If three beds are used, the size of gravel in the middle bed would be intermediate between the sizes in the first and last beds. Typical filtration rates for roughing filters are between 0.3 m/h and 1.5 m/h13 and typical gravel sizes range from 3 mm to 40 mm. Collins et al.8 operated pilot-scale roughing filters and noted that the most influential design variable for kaolin removal was filter length or depth. For algae removal, the most important variable was hydraulic loading rate. For either kind of particles, longer residence time in the roughing filter was related to improved removal. The variables studied by Collins et al.8 were gravel size (2.68 mm, 5.53 mm and 7.94 mm), filtration rate (0.5 m/h, 0.75 m/h and 1.0 m/h) and gravel depth (30 cm, 60 cm and 90 cm). 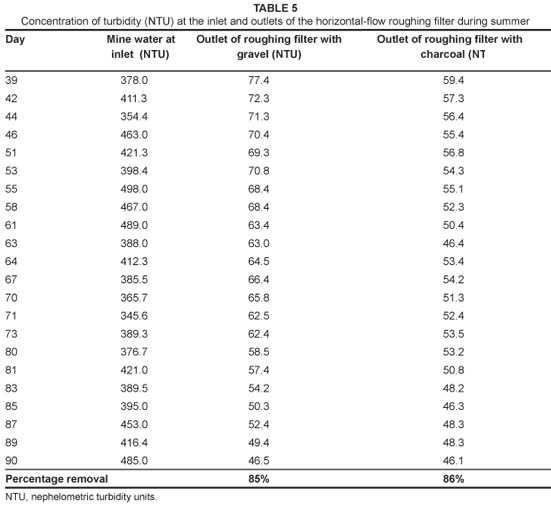 Roughing filters have also been studied by Mahvi et al.14, Dome et al.15 and Ochieng et al.16 Their studies using pilot-or full-scale roughing filters are summarised in Table 1, which also provides their parameter for removal and the percentage removal obtained. Ochieng and Otieno16 discovered that at times when the concentration of total suspended solids is high, even though not to the design level, sedimentation and other filtration processes (such as adsorption) are indirectly increased and removal efficiency is high. Whereas, when the concentration of total suspended solids is low, a lower removal percentage for all the filters was recorded. This observation could possibly be attributed to the fact that a low concentration of total suspended solids in the dry season reduces the sedimentation process as a result of an increase in the colloidal stability which results in less particle interaction. Roughing filters are categorised by their flow patterns: vertical (down flow and up flow) and horizontal flow. Vertical-flow roughing filters operate either as down flow or up flow filters. They are therefore either supplied by inflowing water at the filter top or at the filter bottom. The vertical-flow roughing filter incorporates a simple, self-cleaning mechanism and occupies minimal floor space when compared to horizontal-flow roughing filters. The filter material of vertical-flow roughing filters is completely submerged by a volume of water equating to a depth of 10 cm. The top should be covered by a layer of coarse stones to shade the water and to prevent algal growth that is often experienced in pre-treated water exposed to the sun. Drainage facilities, consisting of perforated pipes or a false filter bottom system, are installed on the floor of the filter boxes. Finally, pipes or special inlet and outlet compartments are required to convey the water through the subsequent three filter units as shown in Figure 1. Unlimited filter length and simple layout are the main advantages of horizontal-flow roughing filters (Figure 1). Horizontal-flow roughing filters have a large silt storage capacity. Solids settle on top of the filter medium surface and grow to small heaps of loose aggregates with progressive filtration time. Parts of the small heaps drift towards the filter bottom as soon as they become unstable. This drift regenerates filter efficiency at the top and slowly silts the filter from bottom to top. Horizontal-flow roughing filters also react less sensitively to filtration rate changes, as clusters of suspended solids will drift towards the filter bottom or be retained by the subsequent filter layers. Horizontal-flow roughing filters are thus less susceptible than vertical-flow filters to solid breakthroughs caused by flow-rate changes. However, they may react more sensitively to short circuits induced by a variable raw water temperature. In this study, a horizontal-flow roughing filter was selected as the pre-treatment filter because it has the advantage of being simple in terms of design, cleaning and operation.20 The construction of the horizontal-flow roughing filter was completed with bricks and polyvinyl chloride (PVC) pipes with two 200-L tanks. To enable a comparative study, two horizontal-flow roughing filters, consisting of one compartment each, were constructed. Wastewater was obtained from the Delmas Coal Mine in the Mpumalanga province of South Africa. The design and sizing of the pilot plant were guided by Wegelin's design criteria.10 This study aimed at verifying these criteria using gravel as a filter medium, as well as comparing the performance of gravel with that of another locally available filter medium, charcoal, to assess whether charcoal can serve as an alternative when gravel is unavailable. Each roughing filter was filled with a different filter medium, with particle sizes ranging from 5 mm to 15 mm separated by an iron mesh in the direction of flow. The filter bed was provided with an under-drain system, which allowed for cleaning of the filters after a certain period of time. A constant filtration rate of 1 m/h was used. The percentage removal of turbidity was used as a measure of performance. Turbidity was measured in nephelometric turbidity units (NTU) using a nephelometric turbid meter. Sampling was done three times a week for a period of 90 days. The sampling points were the inlets and outlets of the horizontal-flow roughing filter units. Analyses of the samples were done on the same day as sampling at the Department of Water Care, Tshwane University of Technology in Pretoria, South Africa. The experimentation period was organised in such a way that both the winter and summer periods were included. Table 2 shows the range of turbidity of the wastewater obtained in summer and winter. where c is the solid concentration, x is the filter depth and λ is the filter coefficient or coefficient of proportionality. where λi is the filter efficiency of each filter cell, Δx is the length of each compartment in the experimental filter cell and cinlet and coutlet are the concentrations of particles in the inlet and outlet of the filter, respectively. where co is the concentration of the influent, ce is the concentration of the effluent and E1, E2, E3, E4 . ...... ... En are the filtration efficiencies for the respective compartments. where e is the coefficient of filtration and L is the length of the filter. where Ei is the filter efficiency for i = 1, 2, 3 . . . n) compartments. The description of the theory above shows that the removal of solids by filtration can be described by an exponential equation. Considering that filter efficiency increases with a decreasing size of filter material, it is beneficial to use the smallest possible size of filter material or to omit the larger filter materials10 and install only a fine filter medium. However, roughing filtration technology requires coarse filter materials as denoted by its name and so the use of only fine filter media to increase filter efficiency is not possible.10 Filter materials which are too coarse, however, have reduced filter efficiency and would therefore require a longer filter length to achieve the same removal.10 In addition, in order to ease hydraulic filter cleaning, the finest filter material should not be more than 4 mm in diameter. 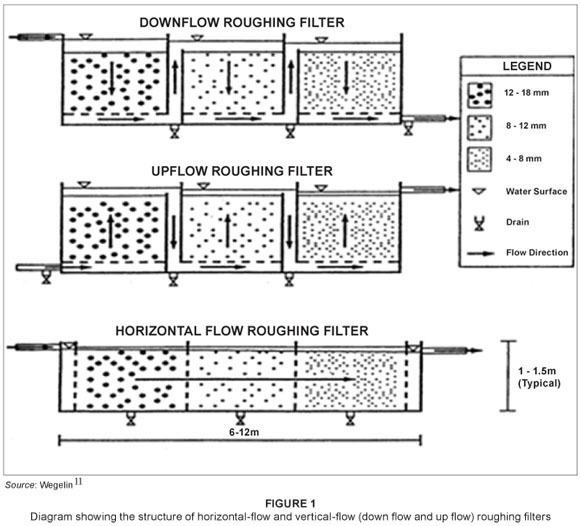 Preliminary design guidelines for horizontal-flow roughing filters are shown in Table 3. In this study, we used filter design variables based on the previous research findings for mine water and drinking water treatments. In order to assess and compare the performance of gravel and charcoal as filter media in turbidity removal, the quality of wastewater at the inlet of the horizontal-flow roughing filter was compared to that of the outlet. The results of turbidity removal by charcoal and gravel are shown in Figure 2. The mine water from the Delmas Coal Mine was treated by horizontal-flow roughing filtration at a filtration rate of 1 m/h. The overall turbidity reduction, however, indicated a distinct improvement in filtration within 23 weeks of operation. Horizontal-flow roughing filtration was able to reduce turbidity by 77% from 450 NTU to 75 NTU during winter (Days 536). Turbidity was further reduced to less than 70 NTU in summer (Days 3990). The filter ripened as biofilm layers developed around the coarse media; this process is important to improve the horizontal-flow roughing filter's ability to remove turbidity. Ripening occurred between 2 weeks and 3 weeks of operation. The average percentage removal of turbidity is shown in Tables 4 and 5. The pilot plant was consistent in the removal of turbidity and it was also observed that charcoal performed slightly better than gravel. Roughing filtration is receiving renewed interest as a result of its potential application in small-scale systems. Modified roughing filtration systems have proven to produce exceptional quality water and require minimal maintenance, despite operating in cold temperatures and highly variable water conditions and encountering a variety of contaminants, making them a suitable alternative to conventional treatments for developing countries such as South Africa. Our results show that roughing filtration may be considered as an efficient, low-cost pre-treatment process. We also observed that charcoal can be used as an effective filter medium for the pre-treatment of wastewater and can serve as an alternative when gravel is not available. Indeed, charcoal performed slightly better than gravel in turbidity removal. This result may be because charcoal has a slightly higher specific surface area and porosity than gravel, which respectively enhance sedimentation and other filtration processes. Gravel and charcoal have a larger total surface area available for biofilms to grow on which, in turn, increases the exposure of biofilm to raw water, thereby increasing the removal efficiency of the filters. Further studies on roughing filters should be pursued. Such studies could include research on the performance of alternative filter media that are locally available (e.g. broken stones and coconut fibre) and the cost benefits of roughing filtration in relation to current treatment processes in use in South Africa. We also recommend that further studies be carried out to determine the longevity, stability and possible rejuvenation of charcoal for use in roughing filtration, given that it is an agricultural by-product stabilised by carbonation. The authors would like to thank the Department of Water Care and Tshwane University of Technology in Pretoria, South Africa, for their assistance in water analysis and Tshwane University of Technology for funding awarded to Onyeka Nkwonta.